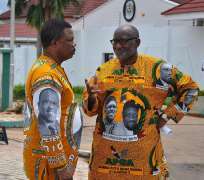 SSG Oseloka Obaze said Chief Willie Obiano and APGA represents the best political and leadership option for Anambra in the forthcoming elections. During a ward tour of Ogbaru communities, Mr Obaze told the Ogbaru people to go out and vote for continuity by voting for Obiano and APGA. He noted that of all the candidates running, none was in a better position to continue and sustain Peter Obi's policies and add value to the development of Anambra than Willie Obiano.